Creating jewellery that evoke emotion and memory is truly what we do best. Naturally, when it comes to bespoke, we seek to capture and fulfil the intimate details of your love story: all in a piece of immaculate, one-of-a-kind jewellery. Our vast library of sapphires, rubies and spinels mean a luxury of choice and exclusivity, but that's not all. With the Choo Yilin Bespoke Service experience, you can have even more at your fingertips - expert advice, our eye for remarkable design, quality gemstones and a ring to last forever. Choo Yilin Bespoke 18kt White Gold Engagement Ring with a stunning 2.1ct Cornflower Blue Sapphire. 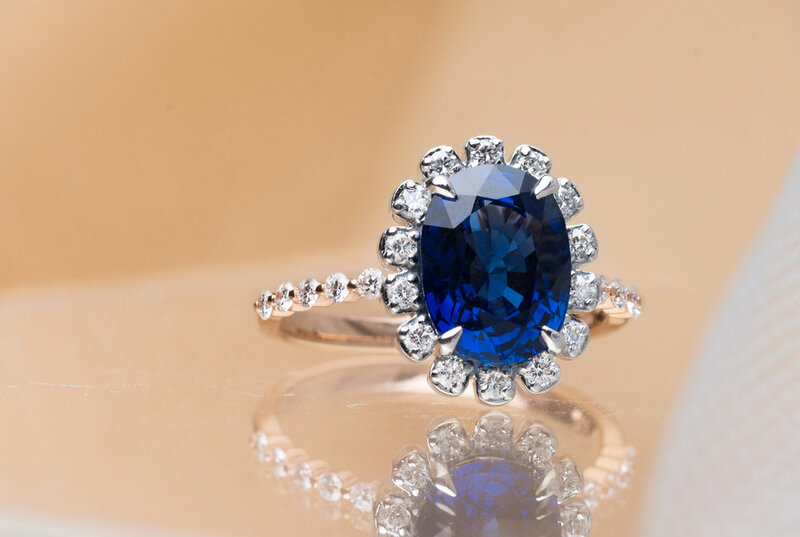 Choo Yilin Bespoke Royal Blue Sapphire & Diamond Embellished Engagement Ring. From ideation to conception, let us walk through the journey with you. Tell us about the deep and personal connection you have with your loved one, what they adore and their hopes and dreams. Like pieces of a puzzle, these will eventually be intertwined into the creation of your unique piece. Unique Emerald Engagement Ring Inspired by The Game of Thrones for James & Cheryl. Following your story from start to finish for a true, one-of-a-kind memento reserved for our most beloved, this is Choo Yilin’s most sought-after service and is limited to an exclusive few appointments in a year. This level of dedication and work is recommended for engagement rings, wedding bands, and life’s most precious heirlooms. Keen to celebrate and immortalise your own love stories, or simply want to find out more? Send us an email at hello@chooyilin.com or book an appointment at our Mandarin Gallery flagship boutique.